Good rock bivvy formed by an overhanging rock cliff located north of Ruth Flat in the East Matukituki. On topo map BZ11 look for the stream draining Peak 1828 and the southeastern flank of Aspinall Peak. 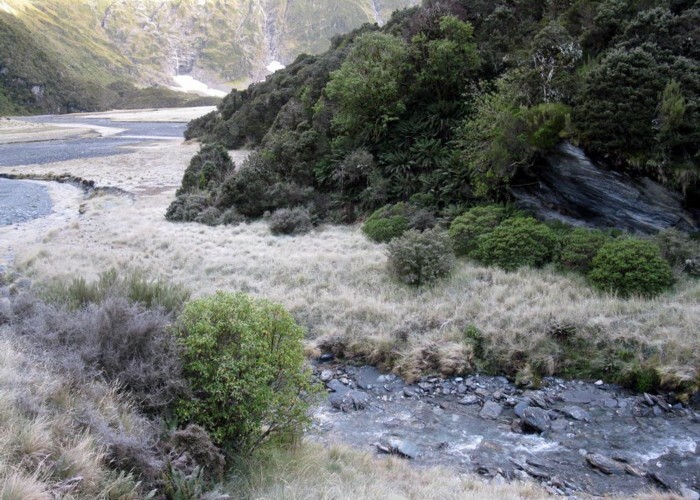 The south facing bivvy is located about 50m from the true left side of the East Matukituki about 5m above the stream at BZ11 709823. Some light scrub gives it a little protection from the south. Sleeps about 4, and has an open fireplace. Water is from a stream 5m away. Ruth Flat Bivy • By Yarmoss. About 1 hours walk from Ruth Flat as marked on map CA11 which is about 1 1/2 days walk up the East Matukituki track from Cameron Flat car park. About 8 hours walk over Rabbit Pass from Top Forks hut in the Wilkin Valley. Added 24 July 2014 by MatthewMatthew. No revisions. 113 views in the past year (9 per month).